In Florida's sub-tropical climate a light-reflective color scheme makes a lot of sense. A cream-colored house with milk colored eaves, window frames, and veranda woodwork bounce back the warming ultraviolet rays of the sun minute by minute, year 'round. But the tropics are also areas of color and excitement. The brave homeowners here added a splash of tobasco to their home's dairy palette for a merry touch of the unexpected. But the hinges on those shutters indicate that they may be as much functional as festive. When nature whips up one of her blender concoctions of wind and flying debris, the shutters are closed to protect all those pretty panes on the double-hung window, which most likely are made with shatter and wind-resistant glass. Most days, of course, the lower window is raised to keep the second floor as breezy as a bikini. 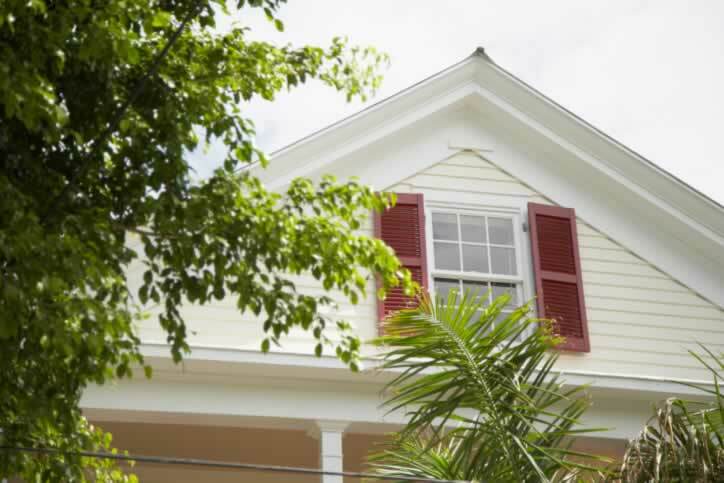 Home > Windows > Window Types > Storm Windows > These Window Shutters Shout "Color!"